Exotic Burst brings a tropical ray of sunshine to the Spring Summer 2017 beauty trends, inspired by the beaches of the Caribbean and its surfer culture. Showcasing a playful, carefree and active lifestyle that the summer weather can bring, intense bright hues emerge in this Trendlook and often add a contrast to offset a vibrancy. 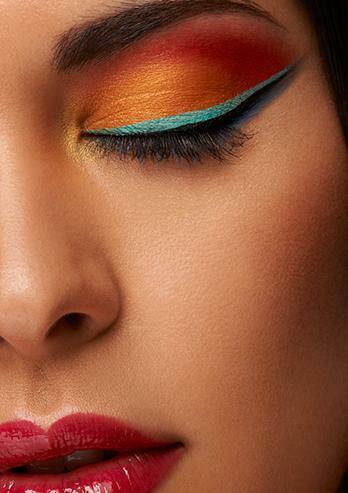 The experimentation of color and liners takes day to evening make-ups to a new level; perfect for the fast paced society we now live in. The rich golden tones of the eye and radiant skin depict the warmth and harmonious glow of a sunset filled beach. With shades of turquoise and blue creating a gradient of graphic winged eyeliner, this stunning look gives beach life a glamourous transformation. In a hint to the high shine of water whether it be your tropical poolside view or the vast, full of life ocean, this look was finished with luscious glossy lips. Ride the waves this summer with Kryolan.